Home » Blog » How You Can Afford the Ultimate Tahitian Honeymoon! My fiance and I really wanted to go somewhere special for our honeymoon. We wanted to go somewhere tropical, exotic and more on the expensive side. We knew we wanted to have children soon after the wedding, and thought we would have less opportunities for luxury travel once we had kids. We really wanted to go to French Polynesia for a Tahitian honeymoon, but it was so expensive! Package ranged around $8,000-12,000USD per couple, and we didn’t know if we could afford it. How did we do it? We used Honeyfund! Hubby and I had already been living together for 3 years. We had all the kitchen equipment, bathroom towels and and living room furniture that we needed. We did not need a traditional wedding registry filled with pots, pans and plates. 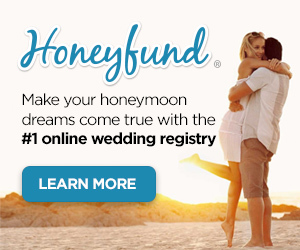 I am so grateful that we signed up with Honeyfund, because we got exactly want we wanted. The honeymoon of our dreams paid for by our guests. They were so happy to fork over a little (or a lot of) skrill instead of picking out a present, wrapping it, and hoping it doesn’t break on the way to wedding venue. Win, win!! Honeyfund does not have fees for guests. Guests use their Paypal or WePay account to send you funds for your Honeymoon. You select your destination. Honeyfund will auto-populate the transportation, accommention and activity recommendations. You choose what you want to keep or add from a wide variety of choices. Your guests give money for a particular activity. They feel like they are apart of gifting you an amazing vacation. Note: Hubby and I thanked each individual by tagging them on social media photos in the activity they helped to fund. Fees: There are small fees if you are receiving a bank direct deposit. You can also get gift cards via Honeyfund with no fees. You can also receive cash or checks from guests directly by mail. Honey fund also functions as a more traditional gift registry if you still want that china set too. Another way that we saved money is by going during the Thanksgiving holiday. While Thanksgiving is a popular American holiday to travel, it was much cheaper to fly and reserve hotels in French Polynesia during this time. Hubby and I love Thanksgiving. It’s one of our favorite holidays. We still had a wonderful French meal for Thanksgiving instead. Thanks to technology, we were able to send our love to family and friends over the internet. Picnic tables in the lagoon. I don’t mind having Thanksgiving here! Staying in those over-water Bungalows in not cheap. A bunglow can cost you $700USD/night or more. It’s just not in the average person’s budget. One way we saved was by staying 5 nights at the Hilton both in Mo’orea and Bora Bora. When you have a Hilton membership, which is free to set up, you earn points for each night stay. Typically four night stays will get you enough points for your fifth night to be free. There are some exceptions and black out dates. Talk to a Hilton representative for more information. An easy way to save big bucks is to get a garden bungalow during your stay in Moorea. Moorea known for its land formations like Magic Mountain and Mount Belvedere. The skies are more cloudy and grey. Beach and sea activities are still pretty awesome, but not as mind blowing as Bora Bora. Bora Bora is the place to splurge on overwater bungalows. You can save around $200USD a night, or $1000 for a 5 day stay in Moorea by getting a garden bungalow instead. When Hubby and I went we were lucky to get a free upgrade at the Hilton in Moorea. They had a few beach side bungalows that were half way over the water, sort of in-between a garden and over-water bungalow. We got the best of both worlds as a free upgrade! We were given a free upgrade from a Garden Bungalow to this Beach Bungalow. Whenever I go on vacation, I often opt in for breakfast service at a hotel. Sometimes a continental breakfast is complimentary. Sometimes you pay a bit more for breakfast to be include. Do this everytime. You usually receive a lot value for your money. I think that getting a great breakfast packed full of protein is an essential way to start your day, especially when you have lots of fun activities planned. You want to make sure you are powdered up and ready to go. Here’s an example of an amazing breakfast we got at the Hilton. Bacon, omelette, fruit, coffee, juice… and an amazing view that’s out of focus. Hubby and I quickly realized we could not afford lunch at the Hilton restaurants everyday. One lunch costs us about $80USD. We were happy to spend that kind of money on a good dinner, but not on lunch. So we decided to hit up the local market. It was a stark contrast to the tourist hotels. It made us feel like we were getting off tourist train and witnessing real Tahitian life. Groceries were still more expensive than what we would pay on the mainland. Of course, any island economy where merchandise has to be shipped in, the prices will be high. We bought a bunch of sandwiches, snacks and booze to curb our appetite between breakfast and dinner. We put our stash in our hotel mini-refrigerator. You have to be careful with the newer mini-fridges. They sometimes have weight sensors that mark an item as purchased the second that you lift it up. We called the front desk to let them know we were taking the hotel’s drinks and food out of the fridge and using our own. See that bottle of water from my $80 lunch. That’s a $12 bottle of water! Worse, I didn’t know they would be bringing me bottled water and charging me for it. Honestly, I should have sent it back the second I saw it was a bottle and not from tap. At breakfast, however, servers brought free tap water and filled up your glasses as often as you needed. This is a good time to fill up your water bottles for the day’s adventure. You can also see if there is free water at the on site gym at your hotel. Another great way we saved money was by booking a romantic couples massage with a highly reviewed local Massage Therapist and Reiki Master on Mo’orea. His business was the number 4 attraction featured on Trip Advisor.. He had little shack right on the ocean. He picked us up and dropped us off. His massage was awesome! Price tag was ¾ of price of a resort massage. Probably saved us around $40 each. This little hut on the beach was not the Hilton, but the massage was just as good or probably better. Because Tahitian islands rely heavily on water taxis to get around, transportation to and from the island and on the island is almost always free. Or… there is some way to make them free. Many businesses provide a free ride if you are a potential buyer. Want a massage… free ride. Want to buy a Tahitian pearl…. free ride. Want a good meal at a restaurant… free ride. Going on an island tour… free ride to the main island! All you need to do to get a free ride from a motu (the smaller outlying islands) to the main island is plan your day according. Go shopping for pearls to get to the island, get a ride back with a restaurant after you finish dinner. Otherwise you hotel is happy to charge you for a ride to the main island, and it’s not too expensive. I love doing travel research on Trip Advisor. They provide extensive customer reviews of accommodations and attractions. They also run a tour booking company called Viator. You can book tours directly from Viator on Trip Advisor. I always look at the original website of the tour company to see if they have a better price on the tour, and always Viator provides better a discount! They can do this by purchasing the tour tickets in bulk and pass on the savings to you. What’s better is that you can take advantage of their free cancelation policy. If you get sick or lazy or whatever happens, just give them 24 hours notice to cancel without charge. Check out Viator offerings for French Polynesia here. Amazing Safari tour of Moorea! Check out Viator for details. No days, hotels often charge an extra fee for Wifi service in your room. When we stayed at the Hilton is was around $10 day. So for a 10 day vacation that was $100. This was an item Hubby and I disagreed on. He really wanted to get Wifi in the room. I was happy to use the free Wifi the Hilton offered in the common areas like the restaurants and bars. For me, going on vacation means getting a chance to unplug from electronics and be more present in the moment. Take deep breaths and enjoy the scenery. It’s hard not to want a Tahitian Pearl. They are so gorgeous, but come with a hefty price tag. Hubby took me pearl shopping at a couple of fancy places. The necklaces I tried on were around $350-600USD. He was willing to buy one, but I was not. Guess I’m a cheap date. But finally I found a gorgeous pearl in a heart setting that I liked. It was a B grade pearl instead of an A grade one. Of all places, we found it in a shop at the airport on Moorea. It costs only $150USD instead, saving us about half to a third of the price. My perfect (for me) Tahitian black pearl in heart setting. In Bora Bora, Hubby and I were invited to a free happy hour that was hosted by the Manager of the Hilton. We got free Mai Tais, and got to talk to our tourists there. It was nice. Ask you concierge at your hotel if there is a happy hour. Sometimes you luck out with a free one like we did. Other hotels might offer a half off or buy one get one free happy hour instead. French Polynesia resides at the equator, and it is hot there. In fact, the sun is extremely intense and takes some getting used it. Make sure to bring your own sunscreen with a high SPF. Right before I left, my Esthetician gave me a sample of SPF 70. Hubby and I used this on our faces, and used SPF 30 on our bodies. You can imagine the results. Our faces stayed white, while our body got pretty red after a week of staying there. I’m super happy that I had good product to protect my face. Also French Polynesia has lot of mosquitoes, and the nasty viruses they carry including Dengue Fever and Zika. Bring the DEET!!! Make sure to bring it on any land tours you go on, and share will other tourists in need. Fun in the Sun, stay protected with sunscreen and bug spray! So many times in my life, I want something and quickly loose hope of ever having it, because I think I can’t afford it. You can afford anything that you put your mind to. You just have to be creative in getting it. Find different ways that you can earn money. Find different ways that you can save money. Be open to gracious ways for receiving experiences. Eventually, you will find a way to make it happen! I hope that this article helped you find ways that you can afford your dream honeymoon! Leave a comment below and let me know your favorite budget travel tips.